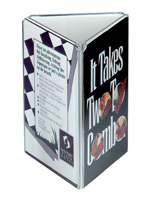 This table tent is a must-have marketing tool for any restaurant or casual dining establishment. Guests typically read the signage and advertisements located on the tables prior to opening the menu. The presence of this table tent sparks interest in curious dining guests. 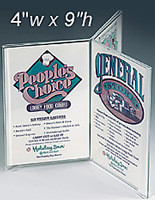 This table tent, also known as a menu card holder, which has six sides, is made entirely of acrylic. 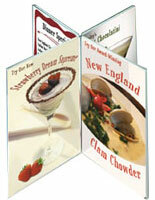 Users can choose to promote six different items, or any combination of products, specials or promotions. 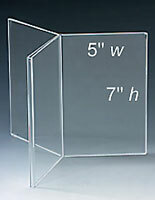 Each table tent that holds (6) 4" x 9" signs features an easy to use design with openings at the top and bottom. Slide old graphics out one end, and new replacement menu cards in through the opposite end. 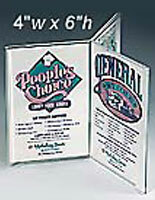 This table tent, tri-fold sign display, is often used to showcase a dessert menu, wine list or seasonal drink specials. 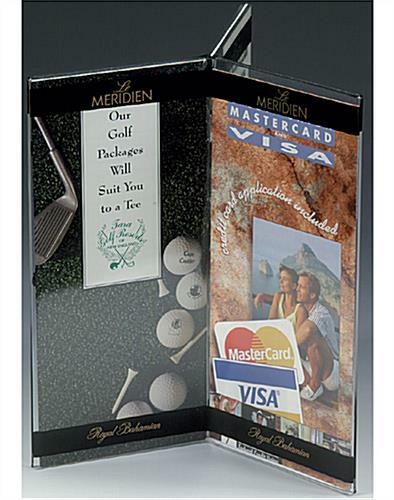 Business offices and other commercials establishments also use this multi-panel frame to post important messages for visitors. This table tent is great for an area that has limited space. 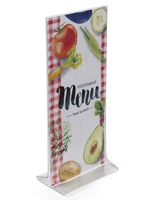 Maintaining this acrylic menu holder is as simple as wiping with a damp cloth and drying with a paper towel. 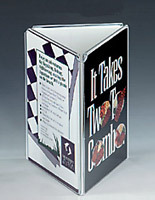 This table tent, such as a tabletop advertising display, is offered in several other sizes within this same series of frames. Choose from various other popular sizes in this online selection. 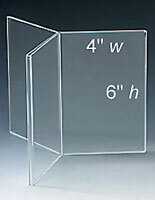 This table tent ships fast when in stock. Nice table tent. Although they tend too break to easily. Good service from displays to go. We love this product. It was just what we were looking for. Thank you for the review, Lori. If you are planning on ordering from us again, feel free to follow us on social media; we offer various social media-exclusive discounts and deals that you may be interested in for future orders! We are very sorry that this item was not to your full satisfaction, Lucinda. Someone from our customer care team will reach out to you promptly to address this. Thank you for your patience.